He argued that Egypt provides more protection for free speech and adversarial journalism than it is given credit for and said Egypt is following a political “evolutionary process” in the right direction. 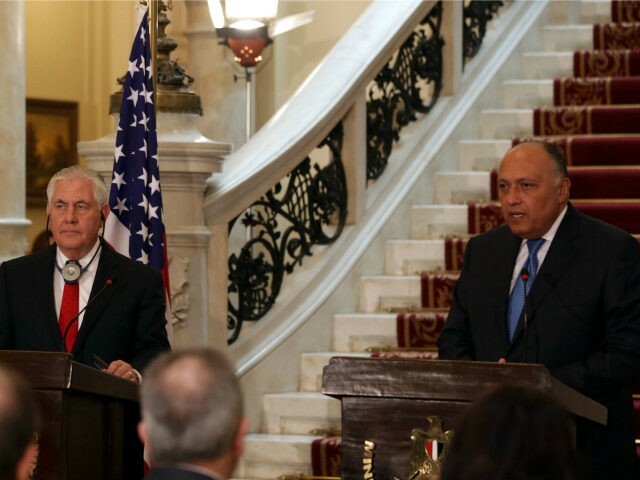 Tillerson’s introductory remarks at the press conference stressed America’s support for Egypt against terrorism, especially the Islamic State (ISIS) militants active in the Sinai. He also stressed the importance of Egypt’s role in resolving the ongoing humanitarian disasters in Libya and Syria. This prompted a question about the arrest and disqualification of just about every candidate who could have run against incumbent President Abdel Fattah el-Sisi in the upcoming election, leaving only a hapless token candidate whose party was busy gathering petition signatures in support of Sisi’s re-election just a few days before he filed his candidacy, beating the registration deadline by less than an hour. The situation has become a source of black humor for the Egyptian opposition. As relates to some of the comments that have been made by certain members of the human rights community and other activists, I would only recommend that you ascertain for yourself the nature and the current situation in Egypt as relates to human rights, and how the Egyptian people view this administration and its efforts to strengthen and protect human rights, and whether there is that sense of restriction that you alluded to. “It isn’t helpful that a certain group projects from a perspective of lack of information, lack of direct association to a society, but it is much, much more important the general conditions, the freedom of press that is available, the variety of television shows, the dialogue and the exchange,” he continued. I think over the last 11 years, the Egyptian people have shown their commitment and their determination and their ability to change their course and to indicate their dissatisfaction. If they deemed that they were dissatisfied, they have been able to change two governments in the last seven years, and they have undertaken legislative elections and know how to protect their rights and to advocate for those rights. For his part, Secretary Tillerson indicated the U.S. government advocates fair and transparent elections in all countries, pushing for “an electoral process that respects the rights of its citizens to make the choices the citizens want to make and the full participation of citizens in those elections.” He did not specify if he believes Egypt’s presidential election meets those standards. Some disgruntled opposition leaders have encouraged Egyptians to boycott what they describe as a farcical election, denying Sisi a huge vote total in an election where he is effectively running unopposed. Sisi’s putative challenger, Moussa Moustafa Moussa of the el-Ghad Party, responded by saying those who call for an election boycott should be prosecuted for treason. On Monday, the speaker of the Egyptian Parliament also denounced boycott organizers as unpatriotic. The Islamic State is pursuing a more active election boycott policy by calling for terrorist atrocities during the election and warning Egyptians they might be killed if they show up to vote. A video attributed to ISIS and distributed on the terror state’s social media channels called upon “soldiers” of the Islamic State to “spoil the day of their apostasy, shed their blood and target the heads of apostasy among them.” ISIS militants believe democratic elections are an apostasy against Islam because their leader, “caliph” Abu Bakr al-Baghdadi, is the divinely ordained ruler of all true Muslims.